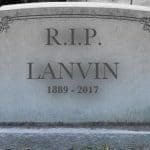 We can say that one of the most classy brands around for the last 5 years is LANVIN. If a woman wears a Lanvin dress she is timeless. If a Man wears a Lanvin suit, he is just as elegant as hot. And now the big event as 2 or 3 times per year is the new H&M collection designed by Lanvin. They started a full buzz campaign on Youtube by revealing part of a making off movie. We can see the top model Natasha Poli that already worked for both brands.